3 Beer Rub | An ORIGINAL BLEND that has been pleasing family and friends for many years. We make a DRY RUB that is GREAT VALUE to our customers with its QUALITY and VERSATILITY!!! This all started with 3 friends, HOME BREWING BEER and BBQing RIBS. We tried many different RUBS and were disappointed with the results, as most of the RUBS were TOO SALTY!!! WE WANTED FLAVOR!!! Experimenting with many RECIPES…using the SPICES we like…finding the proper RATIOS…and have a few BEERS…lead to our 3 BEER BBQ RUB!!! Its BROWN SUGAR based with 10 SPICES!!! In 2004 we were bottling THE RUB in Mason Jars and Gifting to Family and Friends. All we kept hearing was “I NEED SOME MORE” and “HAVE YOU TRIED IT ON THIS”. 3 BEER RUB is an Original Spice Blend. Brown Sugar Sweet with Mild Heat. Pork, Beef, Chicken, Fish/Seafood & Veggies! It’s not just a RUB! 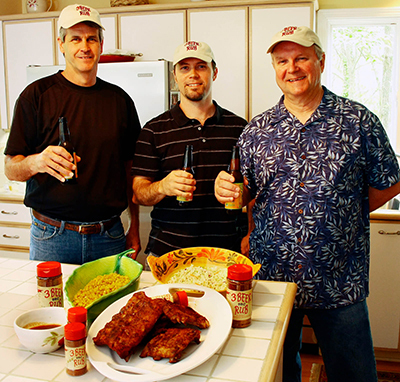 Try 3 BEER RUB for spicing up baked beans, corn, squash, mac & cheese, and other dishes. in local Farmers’ Markets and retail locations. 3 BEER RUB is now sold in over 40 states. "sometime monthly when we have time"